Having supported some of the country’s leading talent such as Paulini, Guy Sebastian, Samantha Jade, Sneaky Sound System and The Potbelleez, Chad Trent knows how to design a show. With a focus on supplying premium entertainment, Chad Trent is a people person driven by the client’s wants, desires and needs, and renown for his efficiency, professionalism and attention to detail. His success is a result of hand selecting musicians, dancers, choreographers and lighting and production teams. This is achieved engineering a full sensorial experience for a spectacular show, using the power of music, entertainment, visuals, theme-ing, costumes, lighting and production. Expect a free flowing, organic stage experience featuring the best in Australian musicians, performers and dancers. Carefully chosen for their artistry, stage presence and chemistry, their love for performing together translates into an electric and dynamic atmosphere. From intimate acoustic duos up to 9 piece show-bands or a visual production spectacular, all themes and styles are covered, including pop, rock, soul, RnB, jazz, musical theatre, popera and classical. We welcome any challenge to build big production shows and dance theatrical numbers, including cabaret, hip hop, street, Latin, musical theatre, jazz, ballroom or swing - so just ask! from Ricky Martin to Cabaret or a Musical Theatre Showstopper. We will delivery a sensory overload to take your Event to the next level ; lights, camera, dances, costumes action!! Amplify’s directive is one of‘dynamic entertainment’ - from ‘dinner-to-dance’, so no matter the size of your event engaging you and your guests , creating energy, vibe and an electric ­atmosphere will be our success. Every event needs that live ambience. With an Acoustic Duo/Trio your guests will be immersed with a musicality that delights the senses with class and subtely. Amplify is the freshest and most energetic new act on the live scene. 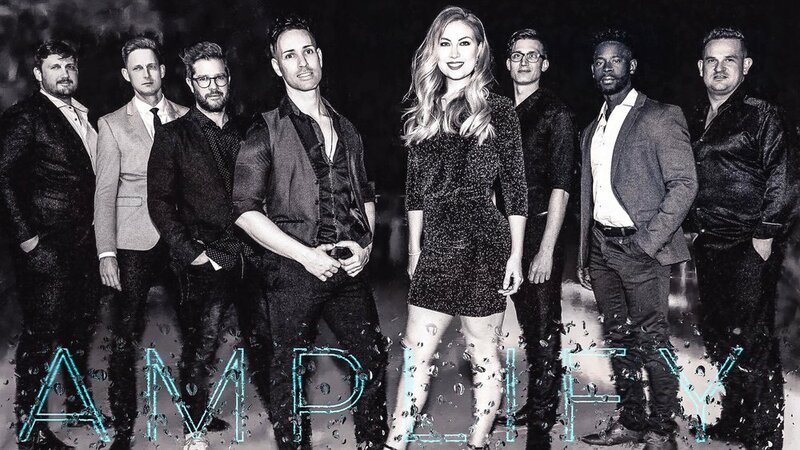 Crafted by some of South-East QLD’s most seasoned professionals, Amplify combines years of touring experience with a renewed passion and energy for live performance.Starting as a duo and fully expandable to trio, quartet and full live big band spectacular, ‘dinner-to-dance’, Top 40's to Jazz, R'n'b to Rock or even a Musical Theatre showstopper. Amplify‘s repertoire is fast becoming known as one of the most eclectic, allowing seamless adaptability throughout your event to steer it in the right direction. Top notch musicianship, first class sound, perfect song selection and the utmost professionalism make every Amplify gig hard hitting and exciting, with audiences left no choice but to have the time of their lives. With Chad Trent at the vocal helm, you will be immersed with one of the most eclectic repertoires available bringing you a collective of musical styles, vocal dexterity. Amplify’s directive is one of‘dynamic entertainment’ - from ‘dinner-to-dance’, so no matter the size of your event engaging you and your guests , creating energy, vibe and an electric ­atmosphere will be our success.